Keep or trade, this giveaway is bound to power up your vape game! The winner of the lottery #1102 for 2x Aspire 26650 INR High Drain 40A 4300mAh Batteries was Sabine Kuehne from Petershagen, Germany on Nov 27, 2018. SHOUTOUT TO VAPERS WHO NEED NICOTINE BASE - OUR SPONSOR SELLS 100MG NICOTINE BASE IN 250ML AND 1000ML BOTTLES AT HONEST PRICES - ANTITPD.COM - THEY SEND WORLDWIDE SO MAKE SURE TO CHECK THEM OUT! Aspire 26650 - bigger battery, bigger power, great capacity. The Aspire 26650 4300mAh high drain lithium ion battery is a solid choice for folks looking for a high capacity 26650 sized battery. 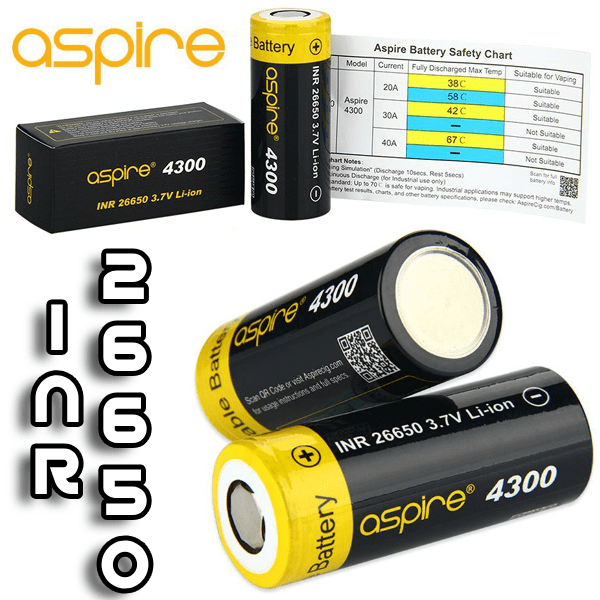 It is the updated version of the Aspire 4200mAh battery. Tested and rated for both pulse AND continuous Loads. The Aspire 26650 has different ratings for continuous and pulse amps. And unlike some manufacturers, Aspire has done a great job being very specific about what those pulse loads mean (10s on, 5s off), which Aspire calls a "vaping simulation". This is great information for all folks considering this battery, since it demonstrates what this battery can really handle without heating up.